With Billions in Lost Productivity, Is It Time for an Election Day Holiday? | Page 5 | Challenger, Gray & Christmas, Inc.
With Billions in Lost Productivity, Is It Time for an Election Day Holiday? This year’s midterm elections are anticipated to bring out record numbers of voters. Both North Carolina and Texas report that the number of early voting ballots has surpassed 2014 totals. American workers will no doubt be tuned in to Election Day coverage from the moment the polls open until results are reported. In fact, a new survey released Tuesday from global outplacement and executive coaching firm Challenger, Gray & Christmas, Inc. found 29 percent of employers are seeing their employees request time off on November 6 specifically to vote or follow election coverage. “While most companies are not experiencing any unusual increase in time-off requests, many workers will be laser-focused on election coverage that day, likely while they are at work. While official counts will not be reported until after the polls close, early voting tallies and exit polling news will keep workers glued to their computers, political podcasts, radios, and televisions,” said Andrew Challenger, Vice President of Challenger, Gray & Christmas, Inc.
Twenty-one percent of those surveyed said they do not typically receive requests for time off on Election Day, but this year they have. Another 2.9 percent reported while they do typically receive Election Day vacation requests, this year they have seen even more. 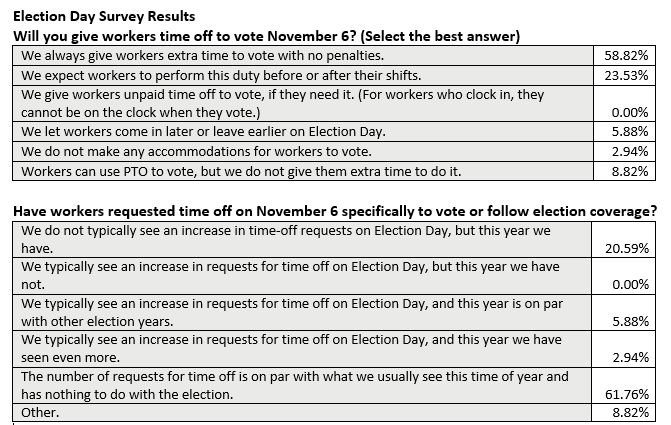 The remaining 5 percent typically receive time off requests for Election Day, and this year is on par with past years. The survey was conducted among 150 Human Resources executives in October. Voting laws regarding allowing workers time off to vote vary by state. Some require employers to allow a certain amount of time to vote, either paid or not, and some do not require employers give time to workers to vote at all. The Challenger survey found nearly 60 percent of companies allow workers time to vote with no penalties. Nearly 6 percent allow workers to come in later or leave earlier to vote. However, 32 percent of companies expect workers to perform this civic duty on their own time. Of those, 24 percent of companies report they expect workers to vote before or after their shifts, and 8 percent say they do not give time to employees to vote, but workers can use paid time off. Another 2.9 percent report they make no accommodations on Election Day. “This year, especially with the polarizing nature of the elections and the number of important issues at stake for Americans, workers will likely be immensely distracted by coverage and could cost employers billions in lost productivity,” said Challenger. Indeed, as of September, there were 156,191,000 employed persons over the age of 16 in America, according to non-seasonally adjusted data from the Bureau of Labor Statistics (BLS), with an average hourly wage of $27.24. According to the American Time Use Survey in November 2017, 82 percent of workers worked on an average weekday. According to the U.S. Census Bureau, 61.4 percent of eligible voters turned out in the 2016 election. If that voter turnout rate is applied to employed Americans, workers who take one hour to vote could cost employers $2.14 billion. That figure only takes into account potential voters who work an average weekday, spending one hour voting or watching election coverage. For the 128,076,620 total workers who are likely working on Tuesday and interested in the election, the cost could reach $3.5 billion per hour. “There’s no doubt any Election Day is important to Americans. This Election Day, however, will be closely watched. Considering the cost to employers and the increase in workers requesting time off to vote or watch election coverage, it might be time for a National Holiday,” said Challenger.